77860500 –Introduction to Criminal Justice, Ninth Edition, provides a comprehensive study of the criminal justice system. The book opens with a discussion on the fundamentals of criminal justice, focusing on crime and the criminal law, and progresses through detailed analysis of the major components of the criminal justice system: law enforcement, the administration of justice, and corrections. An entire chapter is devoted to the juvenile justice system. 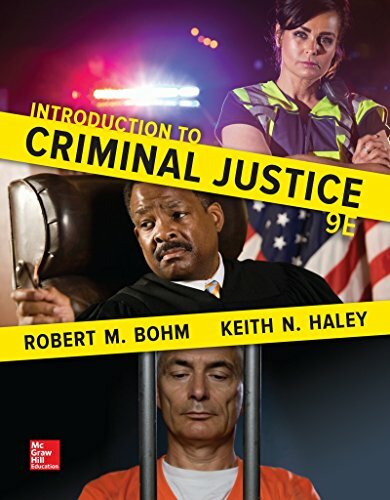 Authors Robert M. Bohm and Keith N. Haley, experts on the subject with nearly 100 years of experience between them as both practitioners and teachers, present criminal justice students with an engaging narrative that encourages them to think critically about the subject. The Connect course for this offering includes SmartBook, an adaptive reading and study experience which guides students to master, recall, and apply key concepts while providing automatically-graded assessments. • Connect®―The Connect Suite effectively engages students in the course so they are better prepared for class, more active in discussion, and achieve better results. Its innovative and adaptive technology addresses a wide variety of student and instructor needs with a rich database of assignable and assessable activities, each attached to learning objectives. Connect, part of the Connect suite, is a web-based assignment and assessment platform that features a number of powerful tools that make managing assignments easier for instructors and learning and studying more engaging and efficient for students. •Connect InsightTM―As part of the Connect Suite, InsightTM puts real-time analytics in your hands so you can take action early and keep struggling students from falling behind. Designed for your tablet or desktop computer, Insight is a series of visual displays providing at-a-glance information regarding how your section, students, and assignments are doing. • SmartBook―As part of the Connect Suite, SmartBook is the first and only adaptive reading and learning experience that changes the way students read. It creates a personalized, interactive reading environment like no other by highlighting important concepts, while helping students identify their strengths and weaknesses. This ensures that he or she is focused on the content needed to close specific knowledge gaps, while it simultaneously promotes long term learning. •LearnSmart―As part of the Connect Suite, LearnSmart is an adaptive learning program designed to help students learn faster, study smarter, and retain more knowledge for greater success. Millions of students have answered billions of questions in LearnSmart, making it the most widely used tool that’s proven to strengthen memory recall, retain student attendance, and boost grades.